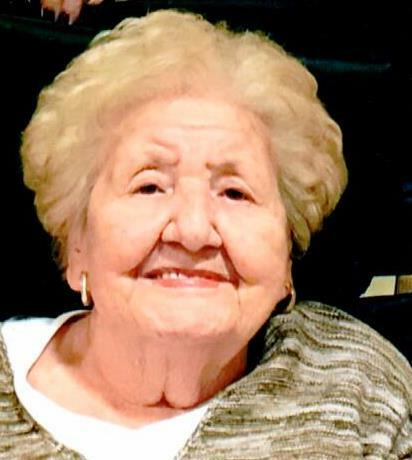 Obituary for Esther M. (Vargo) Ball | Charles B. Jarvie Funeral Home, Inc.
Esther M. (Vargo) Ball, 94, of Springdale, formerly of Frazer Township, passed away Sunday, Jan. 27, 2019, in Presbyterian Senior Care of Oakmont, with her loving family at her side. She was born April 6, 1924, to the late Andras and Elizabeth Margitios Vargo. Mrs. Ball belonged to Our Lady of Victory Church in Harwick and enjoyed crocheting, listening to polka music, and especially baking her many recipes, which she handed down to her daughters. Esther had an outgoing personality and was a social butterfly. She will be sadly missed by all her grandchildren, family and many friends who enjoyed going out to lunch with her, never forgetting to wear her red lipstick. Surviving her are daughters, Carol Ann (Leslie) Misik, of Ormond Beach, Fla., Christine (Larry) Pollick, of Cheswick, and Cherie (Charles) Mesiano, of Cheswick; grandchildren, Justin Misik, Lesley (Jeffrey) Evancho, Tara (Philip) MacDowell, Lauren (Eric) D'Onofrio, Ryan (Katie) Mesiano and Eric Mesiano; great-grandchildren, Anabell and Avery Evancho, Maddox MacDowell, and Luke D'Onofrio; as well as numerous nieces and nephews. A special thanks to Michaele "Mish" Saula and Virginia "Ginny' Chesaro for all the loving care they provided, as well as Patty McClafferty and Tyleda Goodwin. In addition to her parents, she was preceded in death by the love of her life, husband, Edward Ball; sisters, Mary Menhart, Helen Vargo, Sophie Valasek Susan Timko and Elizabeth Aycock; and brothers, Joseph, David and William Vargo. Friends and family will be received from 2 until 8 p.m. Tuesday, Jan. 29, 2019, in the CHARLES B. JARVIE SPRINGDALE FUNERAL HOME INC., 801 Pgh. St. A Mass of Christian burial will be celebrated at 10 a.m. Wednesday, Jan. 30, in Our Lady of Victory Church, with burial to follow in Deer Creek Cemetery, Harmar Township, where she will be laid to rest beside the love of her life. www.jarviefuneralhome.com.